In the spring of 1933, the Rev. George Price began tent meetings on “Flag Pole Hill” just south of Lodi. A number were converted that summer and with the coming of winter, the meetings were moved to rooms above the Schmiedlin Meat Market on Main Street. In 1937, the group was officially organized under the leadership of Rev. Lyle Curtis under the name “Full Gospel” church. In the fall of 1940, a lot on Columbus Street was purchased and a basement was dug. The next year a building was purchased from the “American Legion” and moved onto the site. 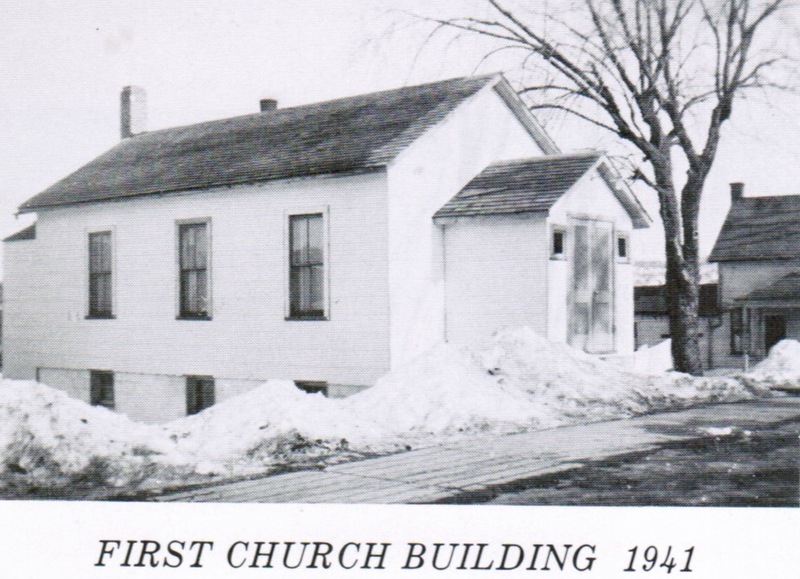 This building was enlarged and remodeled and was dedicated on November 18, 1942, as “The Gospel Chapel” under the leadership of the Rev. Samuel Alexander. Under the leadership of Rev. Earl Sharnick, the church bought the Charles Evert home on Columbus Street to use as their parsonage. This house was sold in 1962, the money received going into the church’s building fund. In 1958, under Rev. Peter Hamelink, the congregation purchased a site on Millston Avenue and broke ground that fall. The first worship service was held in the lower auditorium in September of 1961. The sanctuary of the new building was officially dedicated on May 11, 1964, amidst great rejoicing in God’s blessings. Dr. C.M. Ward of the Assemblies fo God Revivaltime International Radio Broadcast was the dedicatory speaker. The Rev. Pedigo moved into the house at 416 Parr Steet in December of 1966 which was obtained to be used as a parsonage, though the church did not buy it at that time. The Mortgage burning of the church as held on October 3, 1971 while James Gast was the pastor. That same year a new garage was added to the parsonage and a lighted cross was installed inside the sanctuary. In 1974, under the leadership of Rev. Bill Foster, the remodeled parsonage on Parr Street was bought. On February 4, 1979, under Rev. Terry Wilson, the mortgage burning for that parsonage was held. There were may physical changes and improvement made to the church plat and parsonage, and a church van was purchased in 1979. On April 13, 1989, under Rev. Jim Thompson, a new parsonage was bought on Meadowview Lane, and the existing parsonage was eventually converted to administrative offices, classrooms, and an upstairs living quarters to be used by the ministry. After almost 70 years of ministry, the church was dealt several devastating blows and almost shut its doors permanently. In the fall of 2002, both the church building and the administrative office building were sold. The few members that remained continued to meet together at the Lodi Elementary School and believed that greater things were yet to come. In 2005, under Rev. Brian Worthing, the ministry purchased a daycare center named “Country Charm Child Care,” and began to hold services in it small cafeteria, Within a year, a new building project was undertaken to add an addition to the daycare building which is now home to our sanctuary, administrative offices, and serval large classrooms. It was during this time that ministry became know as Prairie Valley Christian Center. In June of 2017, under Rev Christopher Wilson, the Meadowview Lane parsonage was sold with the proceeds going toward the mortgage of the new church building. Many dedicated “men of faith” have ministered in the church and many faithful saints of God have prayed, worked, and sacrificed that a work for God might be established in the community. Lives have been transformed by God’s power, and many lived will continue to be changed as the people of Prairie Valley Christian Center continue to work together with Him for the salvation of souls, as the Scriptures teach.